Red yarn, that is! Look at these beautiful yarns that I found at http://www.jimmybeanswool.com/. 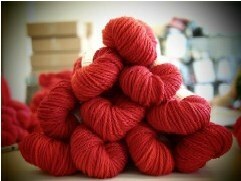 First, this beautiful Malabrigo sock yarn called, are you ready, Ravelry Red! What a great name! Next, from Lorna’s Laces, another sock yarn called, yep you guessed it, Ysolda’s Red. Perfect for knitting up an Ishbel shawl which is on my project to do list! Why the great interest in RED yarn? My niece is going to the University of Maryland next year! Yay Magpie! That means I get to knit red hats, red socks, red shawls, red sweaters, red scarves, red afghans…you get the idea!